Overall a nice, fun and pretty capable camera. It's by no means perfect, but if you're looking for something stylish and a little bit quirky for your next holiday, it's worth taking a look. The Olympus SH-2 is aimed at holidaying and travelling photographers, with its main selling point being a 24x optical zoom which gives you the equivalent of 25-600mm in 35mm terms. You can also boost that up to 40x using the digital zoom. It features a 1/2.3 inch 16-million pixel CMOS sensor, which is accompanied by a TruePic VII image processing engine. Other features include a three-inch, 460,000-dot, touch-sensitive rear LCD screen, the ability to shoot in raw format, full manual control, 18 scene modes, smart panorama mode and a range of art filters. In-built Wi-Fi connectivity is also included. Round the back, the SH-2 has a 460k-dot touch sensitive screen, but no viewfinder. There are also some interesting video options. On top of full 1080p video recording, there's the ability to create time-lapse movies in camera, as well as shooting at 240fps to create slow motion films. The SH-2 is a pretty close competitor with the Panasonic TZ57, albeit with a slightly longer optical zoom range (24x compared with 20x). Olympus has styled the SH-2 very much in the same retro vein as many of its compact system cameras, but there are much smaller travel compact cameras on the market, and it doesn't slip smoothly into a jeans pocket. The 24x optical zoom lens protrudes quite far from the front of the camera in use. Having said that, it does look quite attractive with the strap attached to the sides. You can choose an exposure mode from the dial on the top of the camera, and while there is Program and Manual mode, it's interesting to note the absence of semi-automatic modes like aperture priority and shutter priority. The SH-2 offers program AE and manual modes, but not aperture-priority and shutter-priority. The 24x optical zoom is not the longest on a travel compact, but still gives a very versatile range of focal lengths. On the back of the camera there's a four-way navigation pad and a few other buttons which are all fairly self-explanatory. You can use the touch sensitive screen to set the autofocus point simply by tapping the screen at the point you need. You can also set it to fire the shutter. Most of the settings you'll likely want to change regularly can be accessed quickly by pressing the left direction key. It brings up a number of options, which depend on the shooting mode you're in. As you might expect, you'll find the most options in Manual mode, where features such as White Balance can be set. In Manual mode, you can set aperture and shutter speed. However, you can only choose between two different aperture values which depend on the focal length of the lens at the time – at the 25mm setting, for example, you can choose either f/3.0 or f/8.7. The maximum shutter speed is 30 seconds. If you're not used to shooting in full manual mode, you can find some guidance from the exposure level display next to the aperture and shutter speed display – aim for 0 (zero) for a balanced exposure in the majority of conditions. My overall impression of the SH-2 is that it's really very good – especially when it's used in good light. Details are reproduced well, while colours are beautifully saturated and nice and bright. However, if you examine images at 100%, it's possible to see that there is some image smoothing, even at the lower end of the sensitivity scale. This is not particularly unusual for a compact like this, it's just something to bear in mind. The widest end of the lens gives you an equivalent of 25mm in 35mm terms, which is great for wide-angle shots like this. You can see the flexibility the optical zoom provides in this shot, which is taken at maximum zoom (600mm) from the same position. If you shoot at the higher end of the sensitivity scale, such as ISO 1600, there's quite a bit of detail loss, which is visible even when viewing at standard printing or web sizes, so it's best if you can keep speeds to around ISO 800 or below if possible. When using automatic white balance, the camera tends to produce slightly warm tones under artificial light, but that often happens with the auto white balance on digital cameras. Otherwise colours are fairly accurate. The default all-purpose metering mode is also pretty good at producing accurate exposures, only requiring a nudge of exposure compensation in high contrast conditions. All review cameras go through our ISO sensitivity test, which is shot using a standardised scene under laboratory conditions. Two samples are shown below at the two extremes of the SH-2's ISO range. The right side of the scene is deliberately darker because this shows up noise more clearly. ISO 125: Click here for a full size version. ISO 6400: Click here for a full size version. The ability to shoot in raw format is relatively rare on a compact camera and gives you a little bit more flexibility than most can offer if you want to extract the best possible quality from your photos later. Having said that, it would be nice if you could shoot in raw format when using the digital filters, as it may be that you change your mind down the line. 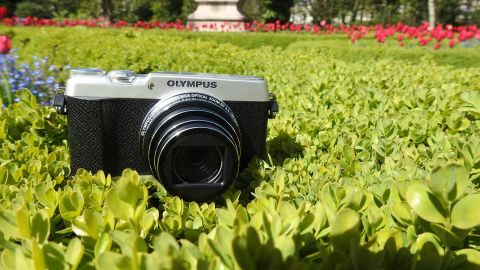 The Olympus SH-2 should find fans amongst those who like the retro look, though its appearance won't be to everybody's taste. It's capable of producing some very nice images, but in poor light at high ISO settings, enough detail is lost to take away the sheen of using it. There are some fun features though, such as the ability to create time-lapse movies, photo stories and add digital filters. Having such an extensive zoom range is also useful, too.